Like most offices we have a restroom at work. This appeared without prompting or warning next to the soap on the sink the other day: Yes, it’s a real product. In fact, I’m pretty sure it’s made by the people who make “I Can’t Believe It’s Not Butter”. 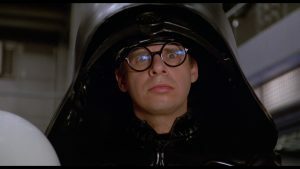 … that the movie “Spaceballs” would be approximately 0.374% funnier if “Dark Helmet” was called “Oy Vader” instead. Some days you’re the cat. Some days you’re the door. I encountered this error when visiting JPMorgan Chase & Co. Bank’s site today: 500: Server Error [%s] You know a web site is broken when it encounters an error trying to deliver an error message. It doesn’t give me much confidence that I trust these folks with my money.